Sen. Shaheera Jalil Albasit, CCAS-G, was elected to her positon during last week's election. About 6 percent of graduate students voted in the election. Even with more graduate senators returning to the Student Association than in years past, graduate voting in last week’s election remained abysmal. About 6 percent of graduate students voted in last week’s election – more than last year, but still significantly less than turnout among undergraduates, according to records obtained by The Hatchet. The low turnout, which has long been an issue in student elections, comes even as more graduate senators ran for re-election than in years past. The number of graduate student voters more than doubled this year, jumping from 347 to 884 – an increase of four percentage points. Still, some constituencies, like the School of Nursing and the College of Professional Studies, had fewer than 20 voters this election. All graduate schools had a turnout rate of less than 20 percent – compared to a rate of about 29 percent for all undergraduates. 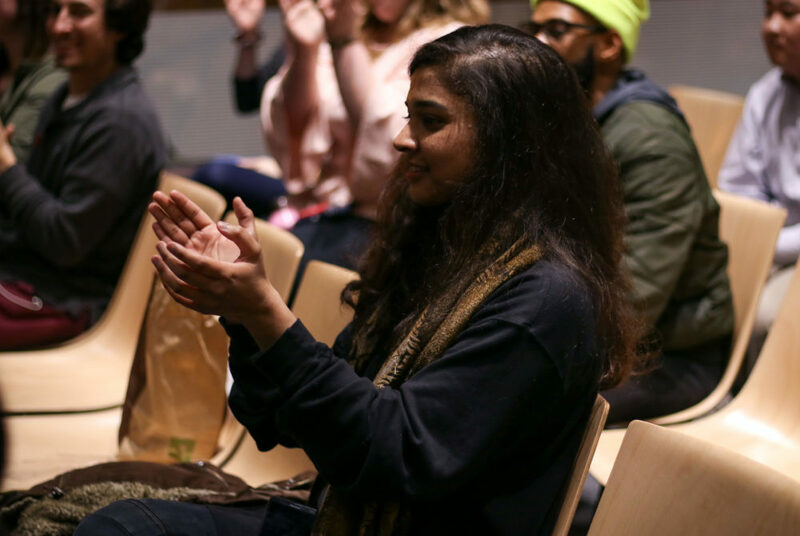 This year, graduate students also had a candidate representing the group for one of the SA’s top two leadership positions for the first time in recent history. But Sen. Brady Forrest, G-at-Large, who was running for executive vice president, lost overwhelmingly after his campaign was hit with accusations of anti-Semitism. The low turnout continued in last week’s election despite an SA effort to focus more on graduate students. The senate passed two major resolutions last month supporting graduate student unionization and calling for increased academic advising resources for graduate students. Bob Wu, the chairman of the Joint Elections Commission, the body that oversees SA elections, said he was satisfied with the outreach effort the JEC and the SA made to contact graduate students about the election. He said “the results speak for themselves,” with graduate student turnout at its highest in recent memory. But graduate senators said the turnout indicates that the long-running disconnect between graduate students and the SA is continuing, especially because many graduate students view the SA as an undergraduate-only organization. Sen. Alvin Lam, SEAS-G, said most off-campus graduate students don’t even know that the SA exists. Lam sponsored a bill in the senate earlier this semester expanding access for online and off-campus students – many of whom are graduate students – by requiring that all senate meetings be live-streamed and allowing off-campus and online senators to virtually participate in meetings. “For those that don’t go to Foggy Bottom during the day Monday through Friday, it’s hard for us to understand that the SA exists, or we don’t even see the posters that the elections are coming up,” he said. Lam said he has tried to engage graduate students through his Twitter account, where he answers questions and retweets the SA’s work. Lam said upcoming elections should be advertised on MyGW or Blackboard so that graduate students who are not on Foggy Bottom will be aware of the campaign season. Sen. Katie Perroots, ESIA-G, who sponsored the resolution on graduate student advising, said the low turnout shows that graduate students don’t feel like they are a part of the campus community. “If they don’t think that the Student Association matters to them or can change anything in their lives, then they’re not going to bother voting,” Perroots said. Law school senators said they aren’t surprised that most graduate students don’t vote because the JEC and the SA have not reached out enough to those students to let them know that they exist. This year, 276 law students voted – about 17 percent of the school’s total population and the highest turnout rate for all graduate schools. “I would say that it’s a lot the SA’s fault because I remember starting law school and having orientation, and there was no representative from the SA to say like, ‘hey, we exist, this is an organization, here’s a thing that you guys should know about,’” Sen. Anisha Hindocha, Law-G, said. Sen. AJ Link, Law-G, said he gets emails regularly from law school students asking if the SA only represents undergraduates. He is unsure if elections should even be considered valid with a small portion of the graduate population voting, he added. “If you’re saying that you’re representing the student body, but only 2 percent of the larger portion of the student body is voting, who are you representing?” Link said, referring to the 2017 graduate student voter turnout.